We’d love your help. 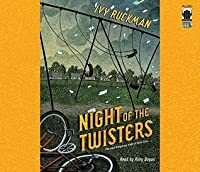 Let us know what’s wrong with this preview of Night of the Twisters by Ivy Ruckman. Storm Chasers meets Stranger Things! An action-packed coming-of-age story of both natural disaster and the bravery it takes to face it. When a tornado watch is issued one Tuesday evening in June, twelve-year-old Dan Hatch and his best friend, Arthur, don't think much of it. After all, tornado warnings are a way of life during the summer in Grand Island, Nebraska. But soon e Storm Chasers meets Stranger Things! An action-packed coming-of-age story of both natural disaster and the bravery it takes to face it. But soon enough, the wind begins to howl, and the lights and telephone stop working. Then the emergency siren starts to wail. Dan, his baby brother, and Arthur have only seconds to get to the basement before the monstrous twister is on top of them. To ask other readers questions about Night of the Twisters, please sign up. This riveting, impossible-to-put-down thriller concerns two friends who see their town ravaged by deadly tornadoes. A story of survival and resourcefulness, this book is really worth reading. PLOT: Dan Hatch explains what a red letter day is. He was in a bike race. He came in seventy-ninth and won the raffle afterward. He won one hundred dollars and a new racing bike. After the race him and Arthur went on a bike ride. They both were talking about Arthur eating supper at Dan’s house. They got back to Dan’s house ate supper and then Dan’s mom had to go to work, his Dad had to help his grandma get the tractor running again so Dan and Arthur were home alone with Dan’s baby brother Ryan. PLOT: Dan Hatch explains what a red letter day is. He was in a bike race. He came in seventy-ninth and won the raffle afterward. He won one hundred dollars and a new racing bike. After the race him and Arthur went on a bike ride. They both were talking about Arthur eating supper at Dan’s house. They got back to Dan’s house ate supper and then Dan’s mom had to go to work, his Dad had to help his grandma get the tractor running again so Dan and Arthur were home alone with Dan’s baby brother Ryan. The tornado sirens went off and then stopped right away. Dan and Arthur were confused, then they heard a big gust of wind coming then the sirens went off again. Dan ran upstairs and got Ryan up from his nap and then they all ran downstairs to the basement bathroom with a flashlight and a blanket. They then waited for the storm to pass. The tornado ripped right through the house and then another one came through it right after. When the storm was over Dan, Arthur and Ryan were alright they had to find a way out of the house. Once they actually got out of the house they met up with Arthur’s sister who was coming to find them. Dan found his family and decided to go live with his grandma out on the farm. Arthur’s family was all ok and together. CHARACTERIZATION: The book never actually describes the characters. Dan Hatch is the main character of the story. He does not change much throughout the story. Arthur is Dan’s best friend and does not change much either. Stacey is Arthur’s older sister. SETTING: This book takes place in Grand Island, Nebraska on June 3, 1980. Told from the POV of 12 year old, Dan, the story of the tornados that destroyed his home and much of Grand Island, Nebraska on the night of Jun3, 1980 was based on actual events. The names were changed, but the story is true. • Dan Hatch - POV character, 12 years old, just had a red-letter day winning a new bike and money in bike race in April (won the raffle and came in 79th place), and now discovers there are black letter days. Night of the Twisters becomes known as Black Tuesday. • Mom and Dad Hatch. Mom is checking on Ms. Smiley and Dad is out at that farm helping Grandpa. • Ryan Hatch - 1 year old brother at home with Dan and Arthur. • Grandma and Grandpa Hatch - live nearby Grand Island in Phillips on a farm. 3rd generation on their farm. • Aunt Goldie - goes bowling the night of tornado and is missing throughout. Found in omaha in hotel two days later with shaky memory. • Miverva - that Hatch cat. • Arthur - Dan's best friend and almost constant companion throughout the story. California transplant, his family doesn't know much about basements and tornadoes. • Stacy - Arthur's older sister that helps save Arthur, Dan, and Ryan at Dan's house. Then helps Arthur and Dan save Smiley. Dan has a big-time crush on her throughout. • Ronnie Vae - Little sister. • Tempest June - Youngest born after the night of the twisters. • Mom and Dad Darlington - Dad has office at the Armory where he's reunited with Arthur and Stacy. • Mrs. Smiley - Elderly neighbor with new storm door. She is found sleeping in the basement and Arthur, Dan, and Stacy save her after Mom and Ryan are taken to Kmart on bus. The kids get Smiley last seat on small bus out of their neighborhood. • Kelly - The police officer that takes the three kids our of their neighborhood and attempts to deliver them to Kmart. Another tornado touches down and almost takes them out in route. The windshield and Kelly's glasses are blown out by the near miss tornado contact and Dan has to drive he rest of the way to the police station. The kids stay the night at the station. • Mrs. Minetti - the matron of the Police station assists the kids. This story oscillates between feelings of terror related to tornadoes touching down and Dan and friends' bravery and sacrifice. Also with a large focus on Dan's relationships and feelings towards other characters, which adds a nice human touch to the story. It's a well-paced narrative that describes a boy's experience one night when tornados tear through his town. Maybe it's because the two boys in the story are also confused about all those questions. I don't know, but something about the way the author writes all the details make them very mysterious and weird. It's pretty tame as far as death and injuries go, but there is a sad part where he thinks about his cat probably being dead (I just skipped that part, so my son was none the wiser), and there are some tense moments where you wonder if characters are going to be alive/okay. They are in the end, but it could still be stressful for a kid. Also, the narrator has a crush on his friend's big sister, and talks about how pretty she is. Nothing inappropriate, but still a little awkward reading it to a 7-yr-old who could care less, so I skipped those brief parts. When a tornado watch is issued one Tuesday evening in June, twelve-year-old Dan Hatch and his best friend, Arthur, don't think much of it. After all, tornado warnings are a way of life during the summer in Grand Island, Nebraska. But soon enough, the wind begins to howl, and the lights and telephone stop working. Then the emergency siren starts to wail. Dan, his baby brother, and Arthur have only seconds to get to the basement before the monstrous twister is on top of them. Little do they know t When a tornado watch is issued one Tuesday evening in June, twelve-year-old Dan Hatch and his best friend, Arthur, don't think much of it. After all, tornado warnings are a way of life during the summer in Grand Island, Nebraska. But soon enough, the wind begins to howl, and the lights and telephone stop working. Then the emergency siren starts to wail. Dan, his baby brother, and Arthur have only seconds to get to the basement before the monstrous twister is on top of them. Little do they know that even if they do survive the storm, their ordeal will have only just begun. . . Fans of adventure books by Will Hobbs and Roland Smith, especially his Storm Runners trilogy will enjoy this fact based fictional account of the Grand Island, Nebraska tornado outbreak, a series of 7 tornadoes that swept through the area the night of June 3rd 1980 leaving a trail of destruction in its wake. It's an action packed story, filled with nail biting, tense, and scary real life situations. It's a wild non-stop ride. But it's also a story about a community coming together and giving each Fans of adventure books by Will Hobbs and Roland Smith, especially his Storm Runners trilogy will enjoy this fact based fictional account of the Grand Island, Nebraska tornado outbreak, a series of 7 tornadoes that swept through the area the night of June 3rd 1980 leaving a trail of destruction in its wake. It's an action packed story, filled with nail biting, tense, and scary real life situations. It's a wild non-stop ride. But it's also a story about a community coming together and giving each other strength after a terrible tragedy. I've been fascinated by tornadoes since I was a very little girl. I was always checking out tornado books from the library so I could learn more about them. I discovered this book during my Storm Chaser obsession back in 2010. I was 13, and I remember my mom telling me I was too old for the book. I read it anyways, and I couldn't put it down. I was sucked in to it and I fell in love. I'm now almost 17 and I still read this book at least once a month. I suppose my love for it has to do with my fa I've been fascinated by tornadoes since I was a very little girl. I was always checking out tornado books from the library so I could learn more about them. I suppose my love for it has to do with my fascination with storms. But this book is the one that got me in to writing my current story. Hour by hour, Dan Hatch, 12 years-old recounts the series of events the night seven tornadoes touched down in his small town in Nebraska. Houses destroyed, lives changed forever, and a struggle to survive are brought forth in this suspenseful fictionalized saga of a town and its people finding a way to outsmart one of Mother Nature's most deadly storms. Night of the Twisters is a little too preachy and in some ways so outdated that kids today may not relate to the underlying story. Characters ar Hour by hour, Dan Hatch, 12 years-old recounts the series of events the night seven tornadoes touched down in his small town in Nebraska. Houses destroyed, lives changed forever, and a struggle to survive are brought forth in this suspenseful fictionalized saga of a town and its people finding a way to outsmart one of Mother Nature's most deadly storms. Now that I'm older and more experienced, I know there are black-letter days as well as red-letter days. Those BIGGIES, the real blockbusters that mess up your life, aren't marked on the calendar either. You never know ahead of time when you're getting one of those. I remembered reading this book as a kid and liking it, so I was excited to see it on the Battle of the Book list. It was pretty intense. Ruckman does an excellent job bringing the readers into the eye of the storm. I felt the pain an Now that I'm older and more experienced, I know there are black-letter days as well as red-letter days. Those BIGGIES, the real blockbusters that mess up your life, aren't marked on the calendar either. You never know ahead of time when you're getting one of those. It was pretty intense. Ruckman does an excellent job bringing the readers into the eye of the storm. I felt the pain and fear of Dan and Arthur. It was easy to imagine the confusion and panic following the storm. This was one of my favorites as a child. The author came to my school and I still have my signed copy. I needed something to help me fall asleep the other night and returned to this. I live in North Texas so tornadoes aren't uncommon so this always gives me a little thrill when I read it. I certainly wouldn't want something this horrific to happen but I like the story and the characters and the message of pulling together and pulling through. This has been one of my favorite books since I was a kid, right up there with Hatchet. It's a story about a pre-teen boy named Dan and his best friend Arthur that weather out a massive tornado in Dan's basement with Dan's infant brother. The book centers around Dan and his neighborhood and the destruction that has occurred. A short book that moves really quickly. It still holds up and I felt like I was in the 4th grade again for a while. This book is really good and I recommend that you read it. This book is like magic tree house book but for just a little more older readers. This book is about two best friends that live in Grand Island, Nebraska. Tornadoes are very common in Nebraska. Little did they know that a few of them will be going through their town. Other than that, I really recommend this book. WOW. I mean once I got started I could not stop. This book was really good. It was about true story of 'night of twisters' in Nebraska (which inspired 'Twister' I think I heard). I would recommend this to someone looking for a little more grown up version of The Magic Treehouse books or someone interested in storms. I would also recommend it from a nostalgic point of view as it reminds me of life in a midwestern small town before the internet. The students were spell bound. Not one of them, at this point, would be willing to trade their California earthquakes for tornado country. Having grown up 5 hours west of Grand Island, I had heard plenty about the night the twisters ripped through town. I thought this book did a great job describing the night from the prospective of a 12 year old. Super fascinating. I enjoyed this book! It was a quick read and very intense. It's about an actual historical event that took place in Grand Island, Iowa, known as "the night of the twisters." 7 tornadoes hit a place in Iowa, and this story is told from a 12-year-olds perspective of the night. I did take a star off because they said: "Oh my___" a lot, but other than that, I really liked Night of the Twisters! I loved disaster books like this as a kid; I had a couple about earthquakes and one about a flood that I read over and over. 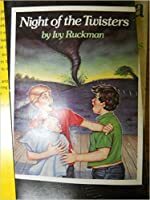 I also loved anything to do with tornadoes; I read the entire nonfiction section in the children's room of my library dealing with storms, and Twister was one of my favorite movies. So I was all kinds of ready to love this book, but it was honestly pretty "meh". Dan doesn't come across as super relatable; he's kind of a blank slate, in fact, except for his annoyance with h I loved disaster books like this as a kid; I had a couple about earthquakes and one about a flood that I read over and over. I also loved anything to do with tornadoes; I read the entire nonfiction section in the children's room of my library dealing with storms, and Twister was one of my favorite movies. So I was all kinds of ready to love this book, but it was honestly pretty "meh". Dan doesn't come across as super relatable; he's kind of a blank slate, in fact, except for his annoyance with his little brother, which seems unearned and makes it kind of hard to like him in the beginning. It takes a surprisingly long time - almost half the book, in fact - for the action to begin, and then when it does, it's not even terribly engaging. The author does a lot of telling instead of showing; for example, never having seen a house destroyed by a tornado, I was having a really hard time picturing the scene, and just saying everything was covered in rubble didn't really help much. She also a couple times has Dan say something like "you can't imagine how I was feeling" instead of actually describing his feelings. A lot of the writing felt like it was keeping me at a remove from the action like that. There were also a few places where it felt like the author was purposely putting the kids in action's way, when realistically the adults should have taken charge of the situation; obviously, in a kids' book, you want the kids to be at the center of things, but you have to give a plausible reason for them to be there, and it's pretty iffy in a couple places here. Read this to the girls while traveling Nebraska. So much hit close to home after experiencing loss from Hurricane Harvey. “during the next few weeks, all that the people in Grand Island could talk about was black Tuesday. Did you get hit? Became the official greeting on the street and would you believe? Was the surest way to get a conversation started everyone had a story to tell. There was no end to the comparing going on. – I was hearing something else is the days went by, something that prove Read this to the girls while traveling Nebraska. So much hit close to home after experiencing loss from Hurricane Harvey. “during the next few weeks, all that the people in Grand Island could talk about was black Tuesday. Did you get hit? Became the official greeting on the street and would you believe? Was the surest way to get a conversation started everyone had a story to tell. There was no end to the comparing going on. – I was hearing something else is the days went by, something that prove itself true again and again: what happens after a tornado is the real story. What do you do for instance when the city’s water supply is blue did when you aren’t allowed to drink what isn’t in the pipes even if you have a faucet to turn it on. By invite there’s talk of looters coming in at night to still whatever’s left. You wonder how you get rid of the tons and tons of debris piling up everywhere period with the hot sun beating down on the humidity soaring. When a tornado watch is issued one Tuesday evening in June, twelve-year-old Dan Hatch and his best friend, Arthur, don't think much of it. After all, tornado warnings are a way of life during the summer in Grand Island, Nebraska. But soon enough, the wind begins to howl, and the lights and telephone stop working. Then the emergency siren starts to wail. Dan, his baby brother, and Arthur have only seconds to get to the basement before the monstrous twister is on top of them. Little do they know that even if they do survive the storm, their ordeal will have only just begun. . . . This short book is a very fast paced read. I was on the edge of my seat through almost the entire book because I wanted to know how it would all end. I had to force myself to slow down so I didn’t miss any details. Adults often pick out books that kids “should” read. I’ve often heard this title mentioned as one of those “should read” books. 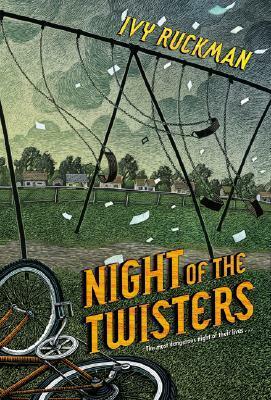 Most of the time, “should read” books are not very entertaining for children, but Night of the Twisters is an exception. Based on a true event from June of 1980, this book gives readers a sense of what it is like to go through a natural disaster. This is an excellent book to use in connection with a unit on weather. I would also like to children compare and contrast this book with the opening scenes from the movie: The Wizard of Oz. The book begins with twelve-year-old Dan Hatch describing his family and sharing that he resents his baby brother, Ryan. It seems Ryan has stolen Dan's parents' attention away from him. Then, the night of the twisters happens. At the time of the tornadoes, Dan, baby brother Ryan, and Dan's friend Arthur are the only ones at home. Dan barely rescues his sleeping baby brother from his crib before the first tornado strikes. Dan's home is leveled, but he, Ryan, and Arthur are safe. The problem is Mo The book begins with twelve-year-old Dan Hatch describing his family and sharing that he resents his baby brother, Ryan. It seems Ryan has stolen Dan's parents' attention away from him. Then, the night of the twisters happens. At the time of the tornadoes, Dan, baby brother Ryan, and Dan's friend Arthur are the only ones at home. Dan barely rescues his sleeping baby brother from his crib before the first tornado strikes. Dan's home is leveled, but he, Ryan, and Arthur are safe. The problem is Mom and Dad are somewhere else. Dan is worried that they were sucked up in the tornado. Once Dan finds his mother and father, he realizes that you can lose every material thing you have and it can still be okay as long as you have your loved ones. I really liked this book. It actually kept me on the edge of my seat for a great portion of the book. The message is great. It took a disaster to make Dan realize that his most valuable treasures were his mother, dad, baby brother, and friends. Have you ever read a book that is so grasping, you just can't put it down? For me, that book is Night of the Twisters by Ivy Ruckman. It is a fictionalized account of the Grand Island, NE tornado outbreak of June 1980. The book tells of how twelve-year-old Dan Hatch, his friend Arthur, and Dan's baby brother Ryan survive a violent tornado in Dan's basement. Upon reading the back cover of Night of the Twisters, I noticed that the target audience for the book is ages 8-11. That is how you know when Have you ever read a book that is so grasping, you just can't put it down? Upon reading the back cover of Night of the Twisters, I noticed that the target audience for the book is ages 8-11. That is how you know when an author is great: when they can write a book on a third grade level that appeals to readers of all ages. That is the type of writer I long to be. While I do want to write at the level expected of me, I know that my vocabulary is not as vast as some, and I will probably never have William Shakespeare's eloquence. I want my writing to be accepted and understood by as many audiences as possible. Chapter where Dan and Arthur are home alone when the twister hits, forcing Dan to retrieve his sleeping baby brother from his crib and huddle in the basement bathroom shower stall, glass breaking all around, water filling the tub, drains sucking, and all the time him wondering if his mom is ok (Dan's mom went out to help elderly neighbor Mrs. Smiley get to her basement). Night of the Twisters starts a little bit slow and is a little bit dated (1984 references to Happy Days and Laverne and Shirley), but once readers get past the beginning background information, they will be hooked by the vivid description of true tornadoes that hit Nebraska in 1980. (Apparently, 2 went counterclockwise, which never happens in 99.5% of Northern Hemisphere tornadoes). The tornadoes destroy a town and tear apart Dan's family and Arthur, his best friend, is there to see it with him. They spend a night in the "woman's center" of the jail since they can't get to the road where KMart is, where most of the civilians (and Dan's mom) have been taken. The policeman who drove them to the jail loses his eyesight when a twister pops up and breaks the windshield glass and his eyeglasses. Dan is forced to drive the vehicle to the police station. Quick but somewhat terrifying book about tornadoes hitting a small town. The story is told from the point-of-view of Dan, a typical twelve-year-old boy. The suspense is fantastic and I was a bit scared about what would happen. Each chapter covers about an hour during the night of the storm, and builds the tension and suspense effectively. Personal Response: This was fast-paced story, filled with some scares and a lot of suspense. I think readers will definitely respond to the b Quick but somewhat terrifying book about tornadoes hitting a small town. The story is told from the point-of-view of Dan, a typical twelve-year-old boy. The suspense is fantastic and I was a bit scared about what would happen. Each chapter covers about an hour during the night of the storm, and builds the tension and suspense effectively. Personal Response: This was fast-paced story, filled with some scares and a lot of suspense. I think readers will definitely respond to the boys’ fear and reactions to the tornado as well as the action-filled plot. I will ask Dan Hatch: When the tornado coming, you are just a twelve years old kid. You are so young, why do you have such great courage to face the tornado? I will ask the author: You wrote this fiction, what is the purpose to create this story? What do you want to tell the readers? I chose these questions because I want to know what forces to push a child to face disaster in that worst condition. I believe that child have huge potential. What's more, I would like to know the purpose of the author to write this story. Maybe just for an idea or the author want to encourage someone who is in trouble. It's very important for a author to create a story. To be honest, I don't want to surf from a tornado in my life. I want to talk about the spirit between this story and my real life. I am willing to change my life more like the story because I admire the spirit of the characters in this story. I want to become stronger and more independent just like these characters when I am in trouble. Ivy Ruckman is the award-winning author of fourteen books, including No Way Out, for which she also wrote the screenplay. She is a former English teacher and creative writing instructor, and has written several short stories for young readers. Mrs. Ruckman lives in Salt Lake City, Utah.